The 4th SynSym Annual Meeting was an opportunity to welcome new Project Leader Maren Friesen, Washington State University to the project. This means SynSym has seven labs involved, based in six institutions across USA and UK. SynSym was well-represented at this congress with Project Leaders John Peters, Phil Poole, Michael Udvardi, Jean-Michel Ané all giving talks. ENFC-2016, Budapest, Hungary, Aug. 2016. Barney Geddes (oral presentation): Discovery of a novel rhizopine synthesis pathway paves the way for synthetic symbioses and nitrogen fixing cereal crops. Florence Mus (poster): Influence of glutamine synthetase adenylylation on nitrogen assimilation and nitrogen fixation in Azotobacter vinelandii. (poster and short oral presentation): Engineering a biased plant rhizosphere to establish synthetic symbioses in cereals. Kevin Garcia and Min-Hyung Ryu (poster): Production of Nod factors by the Gamma-Proteobacterium Pseudomonas protegens. In addition, SynSym project leaders Jean-Michel Ané, Giles Oldroyd, Phil Poole and Michael Udvardi gave plenary lectures. Phil Poole visited Jean-Michel Ané in Madison and gave a seminar entitled ‘Differentiation of rhizobia into nitrogen-fixing bacteroids’ in the Division of Bacteriology, Distinguished Lectures in Microbiology series. Phil Poole gave a talk entitled ‘Transition of Rhizobium from free-living organism to ammoniaplast’ on 13th Oct. 2015. While the talk was given at UNAM Campus in Cuernavaca, it was broadcast live to participating institutions around Mexico. During Phil’s visit to CCG he spent a day with undergraduates on the Program in Genomic Sciences giving two additional seminars and holding one-to-one discussions with students. The SynSym Project was well represented at this conference with talks and posters from Jean-Michel Ané, Lia Kouri, Giles Oldroyd, John Peters, Phil Poole, Min-Hyung Ryu and Chris Voigt. Sixty academics, students and funders attended this symposium organised by Phil Poole to discuss biological nitrogen fixation together with the broader problems of nitrogen in the environment, agricultural policy, food consumption and social issues, in the context of finding solutions. Speakers included the SynSym Project Leaders Jean-Michel Ané, Giles Oldroyd, John Peters and Michael Udvardi. Synthetic Symbioses 2nd Annual Meeting was held in conjunction with the mid-term meeting of the Nitrogen Ideas Lab Projects, Burnham Beeches, UK on 15th-16th Sept. 2015. Report of the meeting and the scientific presentations by post-docs available for SynSym members. All members of SynSym project were invited to the mid-term workshop for grants funded as part of the ‘Nitrogen: Improving on Nature’ initiative. Along with Synthetic Symbioses, other projects funded were Nitroplast: A Light-Driven, Synthetic Nitrogen-Fixing Organelle, Oxygen-Tolerant Nitrogenase and Designing Nitrogen Fixation in Oxygenic Photosynthetic Cells. In Sept. 2017there was a PLs’ meeting held in conjunction with the 20th ICNF conference in Granada, Spain. Minutes available here. There were Skype meetings for all SynSym PLs in November 2014, April 2015 and June 2016. Minutes available here. In Sept. 2015 there was a PLs’ meeting held in conjunction with the Nitrogen Ideas Lab mid-term meeting at Burnham Beeches, UK. Minutes available here. Jan 2017, Barney gave a talk; Engineering rhizopine synthesis and perception in bacteria and plants. June 2016, Florence gave a talk; Strategies for increased ammonium production and nitrogen fixation in free-living or plant associated nitrogen fixing bacteria. In addition, Amaya gave a talk; Electron flow balance to nitrogenase and respiration. May 2016, Ponraj gave a talk; Engineering Rhizopine Biosynthesis in Cereals. March 2016, Kevin gave a talk; Engineering synthetic symbiosis between plant and bacteria to deliver nitrogen to crops. February 2016, Kyle gave a talk; Rhizosphere-specific genetic switches. January 2016, Lia gave a talk; Ammonium Transporters (Setaria and barley). November 2015, Barney gave a talk; Characterising rhizopine synthesis, regulation and catabolism for transfer to synthetic symbiosis. October 2015, Min-Hyung gave a talk; Engineering Platforms for nif Transfer across Species. June 2015, everyone gave a quick update on recent progress. May 2015, Florence gave a talk; Strategies for increased ammonium production and nitrogen fixation in free-living or plant associated nitrogen fixing bacteria. April 2015, Ponraj gave a talk; Engineering lipochitooligosaccharide (LCO)-inducible rhizopine biosynthesis for synthetic symbiosis in cereals. March 2015, Amaya gave a talk; Forging the blueprint for engineering nitrogen fixation in aerobes. February 2015, Lia gave a talk; Metabolite analysis in roots and exudates from S. viridis and maize. January 2015, Kevin gave a talk; Engineering synthetic symbiosis between plant and bacteria to deliver nitrogen to crops. December 2014, Barney gave a talk; Engineering synthetic symbiosis: characterizing rhizopines and developing tools. October 2014, Min-Hyung gave a talk; Creation of large part libraries for the development of Synthetic Symbiosis. SynSym was well represented at the European Nitrogen Fixation Conference with all six project leaders giving talks. In addition, five posters were presented by the post-doctoral scientists describing work on the project. The first annual Synthetic Symbioses meeting was held on Saturday 6th September 2014, prior to ENFC-2014 at Costa Adeje Palace Hotel. Timetable for this one day meeting: SynSym Sept2014 programme. 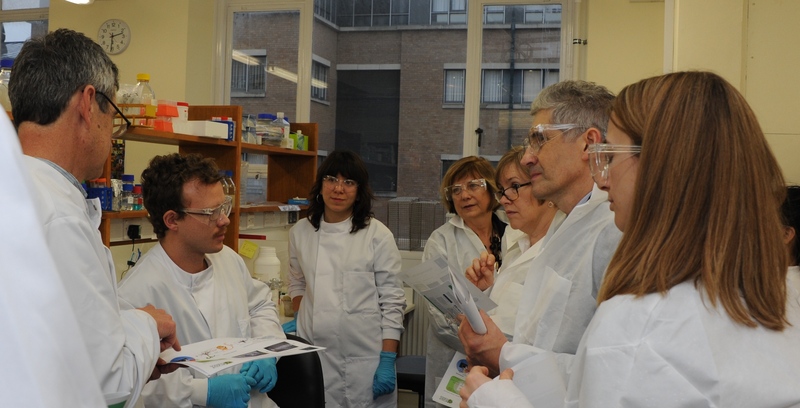 Members of the SynSym research project were invited to the Bill & Melinda Gates Foundation-funded ENSA-C4RICE-RIPE-Cereal Engineering Workshop held at Dunstan Hall, Norwich, 27th-29th May 2014. After a series of talks covering the latest developments in cereal engineering, the workshop was followed by a day of training in Golden Gate cloning at JIC, Norwich. The inaugural meeting of the Nitrogen Ideas Lab Projects was held at the Marriot Hotel in San Franscisco from 27th February – 1st March 2014.